The Millennium Seed Bank Project is the largest conservation project ever conceived. It will appeal to scientists, artists and photographers alike. Art and science collaborate on a fascinating story with extraordinary images in a highly-acclaimed book. Seeds, the most complex organs produced by plants, ensure the biodiversity of our planet. They vary from the impressive Seychelles nut that weighs twenty kilos to the dust-like seeds of the orchids. The evolution of their highly sophisticated structures from prehistoric times to today makes fascinating reading as do the wiles plants use to attract and deceive their chosen pollinators. 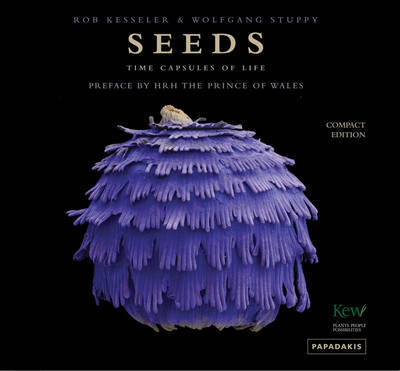 The extraordinary images that accompany this story provide an unprecedented presentation of the magnificent diversity of seeds in all their exquisite beauty and sophistication. Fruits are the keepers of the precious seeds that ensure our future; some are edible, others inedible and many, quite simply, incredible.